Posted July 11th, 2009 at 10:54 am | Log in to reply. hi maangchi.. i love korean food. but i never cook it b4. I would like to try cooking it. but i bought the red pepper paste. but i noticed that u use red pepper powder in this recipe. 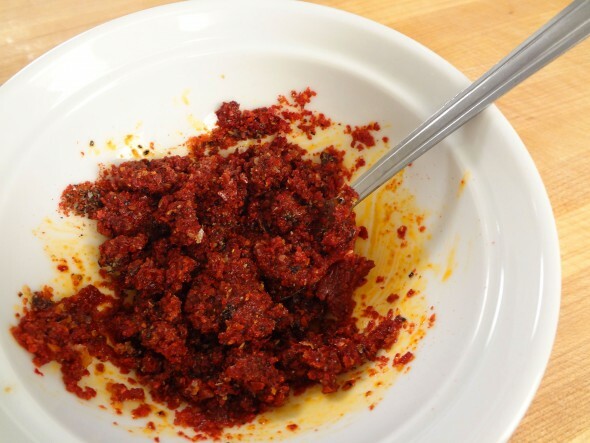 is it possible for me to use red pepper paste instead of pepper powder? and does it taste the same? Posted July 11th, 2009 at 8:37 pm | Log in to reply. 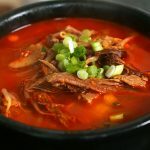 For yukgaejang recipe, you need hot pepper flakes instead of hot pepper paste. I would not use hot pepper paste because it has its own strong flavor. 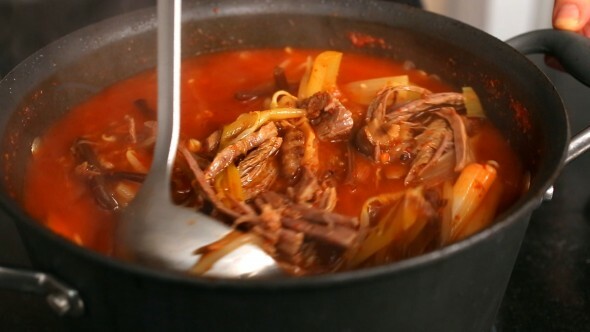 You will have to get right ingredients to make delicious yukgaejang. Posted June 10th, 2009 at 10:17 pm | Log in to reply. Your website is so amazing!!! I miss my mom’s cooking and can’t go to see her often enough. Your recipes taste just like hers and has inspired me to continue to cook Korean so that I can someday cook it when I have a family! Question… At the Korean market I could only find either wet royal fern, or dried fernbrakes. I bought the dried fernbrakes… is that the same as Kosari? Thank you! Posted June 12th, 2009 at 12:05 am | Log in to reply. Yes, it’s kosari! Do you know how to handle dried kosari? I’m copying and pasting my answer from my comment section under bibimbap recipe. 2. Boil it for 30 minutes and don’t drain hot water and let it soak. Wait about 6-8 hours. I usually boil it at night and drain it next morning. Posted May 9th, 2009 at 8:23 pm | Log in to reply. 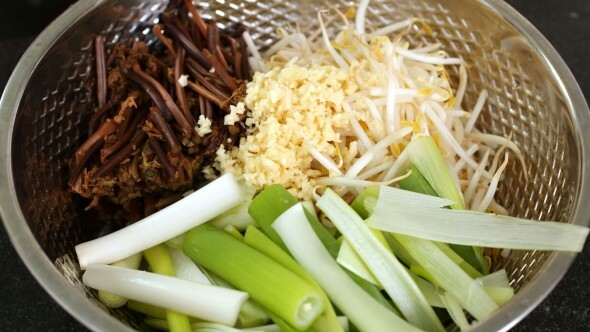 What other vegetable can I use if I do not have celery, kosari or Bean sprouts on hand for Yak gae jang ? Posted May 9th, 2009 at 9:00 pm | Log in to reply. Lots of green onions and leeks. I sometimes make Yukgaejang with only green onions. It’s still delicious! Posted May 7th, 2009 at 7:57 pm | Log in to reply. 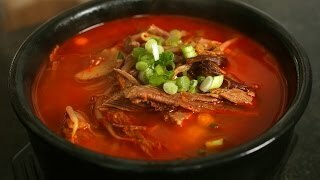 This all sounds, looks and taste fantastic, However, i have tried and failed a million time to make Kalbi Tan Soup( spelling ??? ), Do you have any suggestions besides go to a restaurant. Posted May 7th, 2009 at 10:41 pm | Log in to reply. I have not posted galbitang recipe yet. I will post it someday in the future. If you like galbitang, I’m sure you will like beef and radish soup. It’s very easy to make. Check this out. Thank you for your interest in my recipes. Posted April 23rd, 2009 at 8:01 am | Log in to reply. Thank you so much for your recipes and also you nice videos. I have a question about soy sauce, because now I live in Japan, may I use Japanese sauce(we called soyu) instead Korean soy sauce? I am worry the taste will be changed. Thank you before. Posted April 23rd, 2009 at 5:04 pm | Log in to reply. Posted April 3rd, 2009 at 9:40 pm | Log in to reply. I have made your yuk-gae-jung a couple of times now and I’m loving it! It’s my favorite soup, but I’ve always had to rely on my mother or aunts to make some for me. Now I eat it on a regular basis because I can make it myself. One person asked about that smokey flavor. My aunt suggested that you can make pull more flavor out by frying the hot pepper flakes and oil mixture first. You have to be really careful not to burn it. But if you catch it JUST as it’s about to turn brown, the flavor changes and has that nice smokey flavor I think you are looking for. Anyway, thanks SO MUCH Maangchi for making my life so much more enjoyable! I make it at least once a month now!! YUM!! Posted April 3rd, 2009 at 8:21 am | Log in to reply. hi,maangchi is it ok if i wiil use pork instead of beef? Posted April 3rd, 2009 at 9:44 am | Log in to reply. How about using chicken. 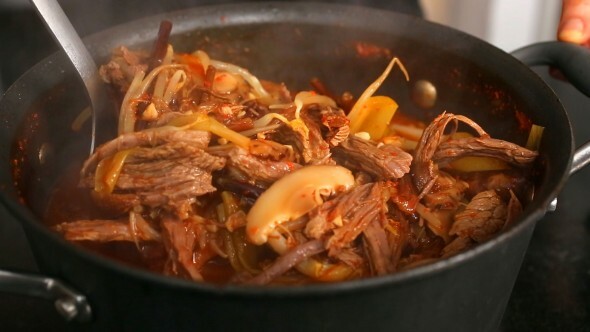 I don’t use pork for Yukgaejang. But if you want to use pork, why not. Posted April 2nd, 2009 at 11:09 am | Log in to reply. Can i use this broth to act as the broth for the spicy korean shabu shabu? so, I am cooking it on saturday!! hehe. I am so excited..
Posted April 2nd, 2009 at 4:21 pm | Log in to reply. yes, you could use the broth for shabushabu stock. Posted April 2nd, 2009 at 6:53 am | Log in to reply. Posted April 2nd, 2009 at 4:20 pm | Log in to reply. Posted April 1st, 2009 at 6:35 am | Log in to reply. I think the restaurant made the soup base by boiling lamb meat. Posted March 31st, 2009 at 7:56 pm | Log in to reply. the Lamb was stripped and cooked, the soup base was a little milk also..
Posted March 31st, 2009 at 7:48 am | Log in to reply. hmm, the lamb hot pot dish sounds delicious especially with sesame leaves (perilla leaves)! It must be invented by the owner of the restaurant. Was the meat cooked and stripped? 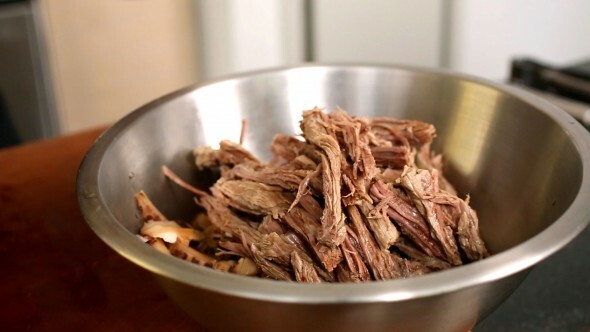 Korean style hot pot (called “shabu shabu”) is usually made with beef sliced thinly. Anyway shabu shabu recipe will be posted someday on my websie and YouTube. I’m going to use beef. Posted March 30th, 2009 at 10:35 pm | Log in to reply. How are you !! I once had a lamb hot pot from a restaurant and it was soooooo delicious. Would you know what it is and maybe show us how it is made ??? It had stripped lamb meat, lots of sesame leaves, chives, mustard seeds, the soup wasn’t spicy. It seems that this dish is not on the menu from many Sydney restaurants. Posted March 15th, 2009 at 11:06 pm | Log in to reply. Posted March 15th, 2009 at 10:47 pm | Log in to reply. Love your site. My husband loves this soup and I want to make it but I think I tasted a little ginger in the ones at the restaurants. Can I put ginger in this soup? And if so how much? I also have a request, do you have recipes for pickled sides? like pickle, radish or jalepeno in soy sauce brine. The video was watched 997,391 times on YouTube & has 17,859 likes! This video is a remade version of an earlier recipe. The original video was posted on and has 0 views.